Created from the series of Olivia books, the TV show demonstrates that Olivia the Pig has tremendous attitude! Each episode is based around everyday life situations, in a world where every character is a pig. American toy company, Spin Master, has gained the master licence for a whole series of Olivia toys. The naturally include all the main characters such as Ian and William, Mum and Dad, as well as Perry the family dog and Edwin the lazy cat! 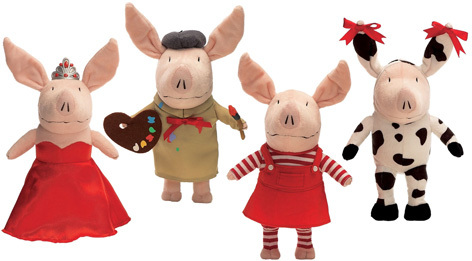 Olivia The Pig toys include all the main characters in plush form, as well as a series of collectable figurines and dolls that come with some exciting accessories. Olivia toys also include some great playsets like the restaurant and carnival themes. Watch out also for jigsaw puzzles and games as well as finger puppets, bean bags and a whole series of other licensed kids products.